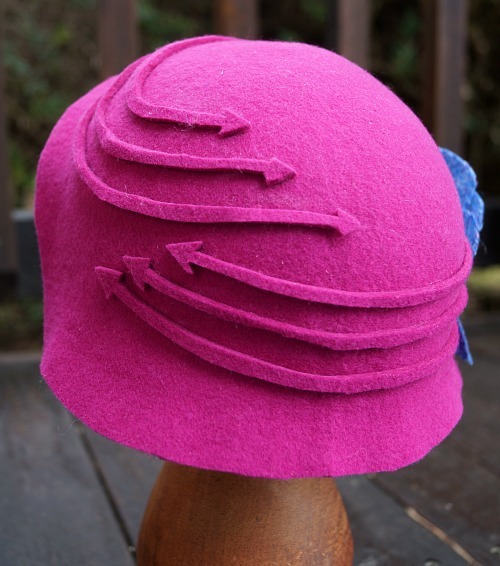 There's so much to love about 1920s hats, and many fun styles and materials to explore, but blocked felt cloches are a favourite of mine! There's something extra special about this one though. Any guesses? Well, there are the arrows. They are pretty fabulous. Not as neat as I wanted them, naturally, but a really lovely feature. 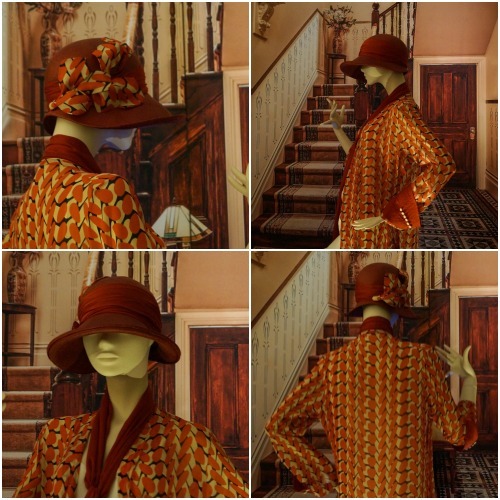 The whole hat is a close-ish copy of one from a 1920s catalogue, that I fell for as soon as I saw those arrows! But there's more that's new and different. This is the first hat I've blocked on my 19 inch hat block - that's toddler size! I'm really excited to work on some hats for young kids. Naturally it's going to be nice to be able to make lovely things for my own daughter, but I'm also just enjoying working on a smaller scale and seeing the way it influences me. 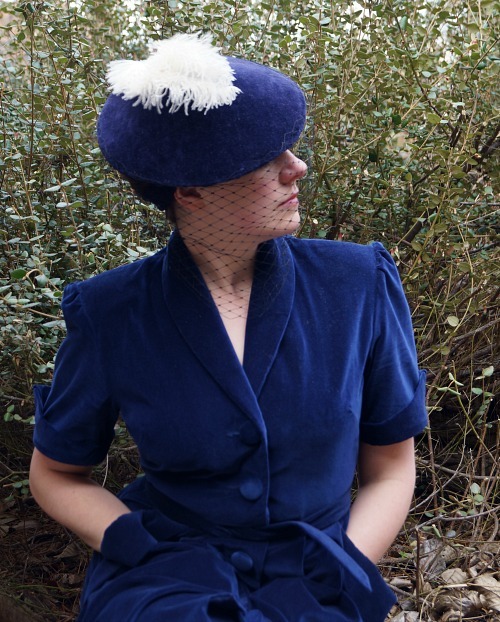 Although I imagine I will make some cutesy, clearly-just-for-kids designs as well, I really want to create hats with classy vintage elegance that adults would be happy to wear too. 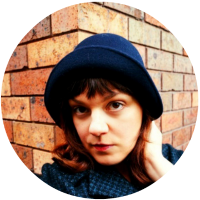 I want to stay true to my taste, and see these hats as just another opportunity to explore the mountain of vintage inspiration bubbling up around me. Yet I think as I made it, I found myself happy to make some decisions about trim that I might not have done on an adult hat. I don't mind this cute little fabric flower, but I do feel it has a "little girl" quality to it. The arrows save it, I think, keeping it different and interesting. 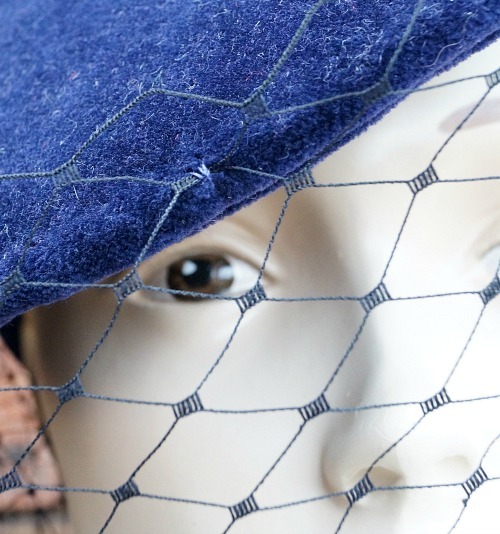 Expect to see more 1920s influences in toddler size, because I think cloches are a pretty but practical option for small people, and there are so many lovely trims and shapes to try out. What other vintage styles do you think would be fun for toddlers? 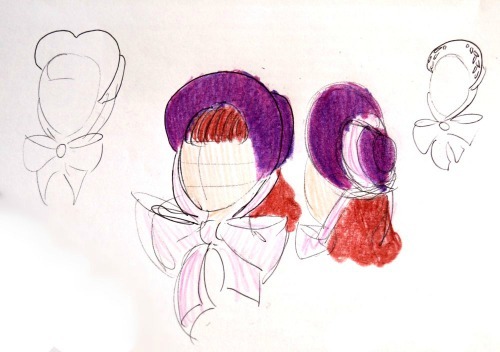 Trove Pattern Project - 1939 "Doll's Hat"
The Trove archives hold such a lot of treasures that it becomes hard to choose which pattern to review next. This time, I put the decision out to the Instagram community, and the response was strongly in favour of this option. It wouldn't have been my pick, but I went with the crowd, and I am not unhappy with the end result. This free pattern is from the January 5th, 1939 issue of "Table Talk", a Melbourne publication that lasted from 1885 to September of 1939. They call it "one of the smart new "doll's hats"" and say that you can make it in a night. You can find the full instructions here. They recommend velvet or velveteen. I've used an old fabric from my stash that is...one of those two! The thickness of the velvet-type fabrics is great for hiding stitches and for looking nice, but it does get a bit bulky at the edges. And collect fluff. I'd love to see this in a funky cotton print for more of a daytime look. The foundation is sparterie or buckram. 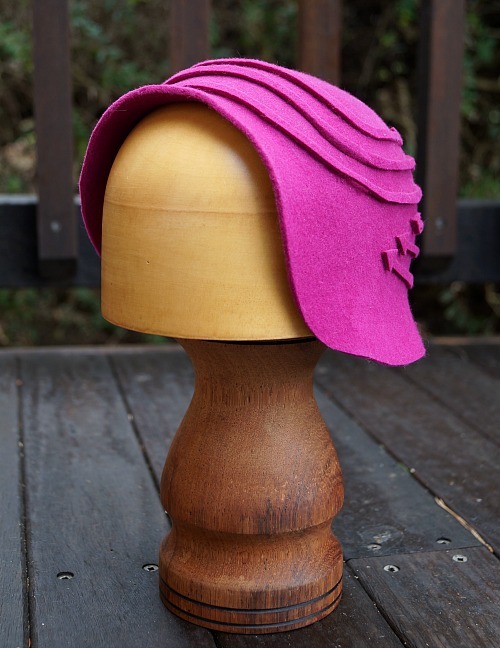 You won't find much sparterie around these days, but buckram is easy enough to find from millinery suppliers. 10 inch wide veiling. I think mine was about this width. If you didn't want the full-face veil effect, you could use narrower and have it just cover the eyes. 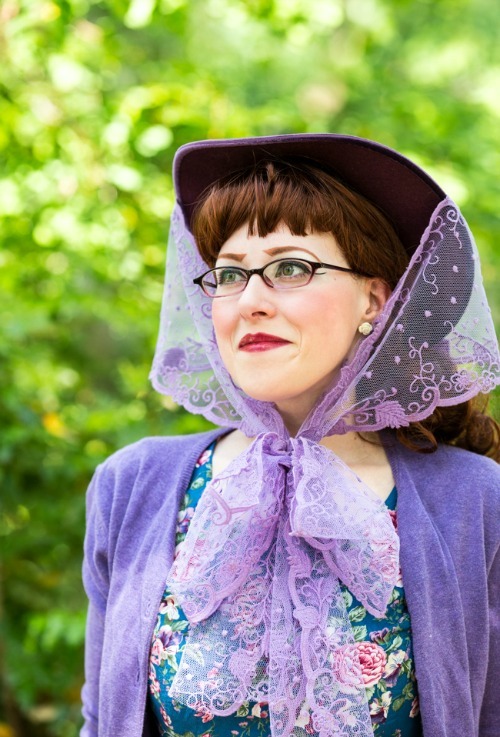 You could also try using a soft tulle or net instead of the veiling. Ostrich feather. I am avoiding feathers in general, but since I did still have one around, I decided to use it. Other fun trim options could include flowers, fabric loops, a bow of veiling, anything that can cover the seam! I also wired the edge, and I would recommend doing this, so add some millinery wire to your materials list. 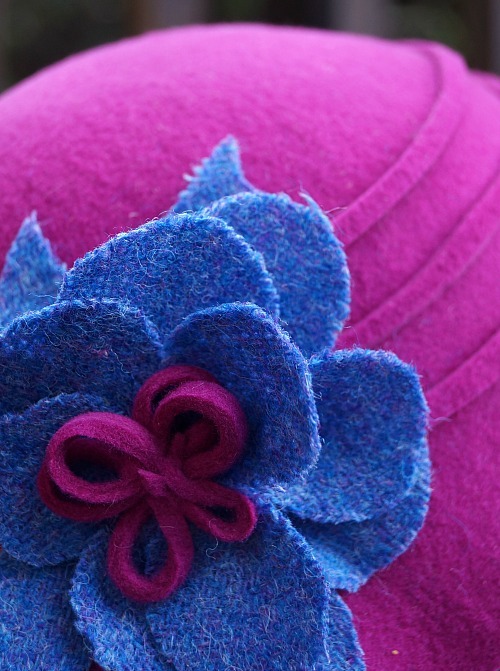 As the title of the article says "You can make this smart hat without a pattern." By which they mean that it is easy to draft, since the shape is a cone, making the pattern a circle with a sector (pizza slice) cut out. I found the size to be good for my face, but it would be easy to scale up or down. Remember that the radius of your pattern circle becomes the slant length of the cone, and the bigger the sector removed, the pointier the cone. The instructions, like most vintage ones, are brief compared to what we are used to, but the pattern is very simple. As long as you can do some sort of hand stitch and you tuck in all the raw edges, it should work out fine. They recommend that the underside fabric be tacked in a few places to keep it on, but I would honestly recommend glue. I was taught to use fabric glue (sparingly) on concave surfaces to hold the fabric on, and I think it is the best way. You will be sewing the edge anyway, and it also helps keep your fabric in the right place as you do so. I didn't attach the veil all the way around the edge, just sewed it securely at the back, and tacked a few points around the front. I also should have pulled the bottom edge up more. I have too much veiling floating around instead of the face-wrapping look in the illustration. One thing I didn't do, and should have, was make my trim cover the point where the band is attached to the inside. You can see in these photos that the band is pulling the hat in and making a dent there! Oops. I moved my feather over it, but it was a windy day so it never stayed in place. And yes, you could probably make it in a night. If you have the kind of life that allows a full night of sewing. I made it in bits and pieces of three nap times, but it wouldn't have been more than 3 or 4 hours, I think. 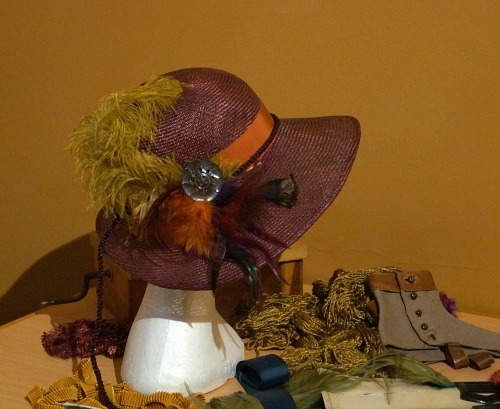 This hat is designed to be worn forward and titled to one side, down close to one eye. For a different style of wear, the positioning of the band may need to be adjusted. It can be tilted to the left or the right, and you can see I changed over partway through my shoot! 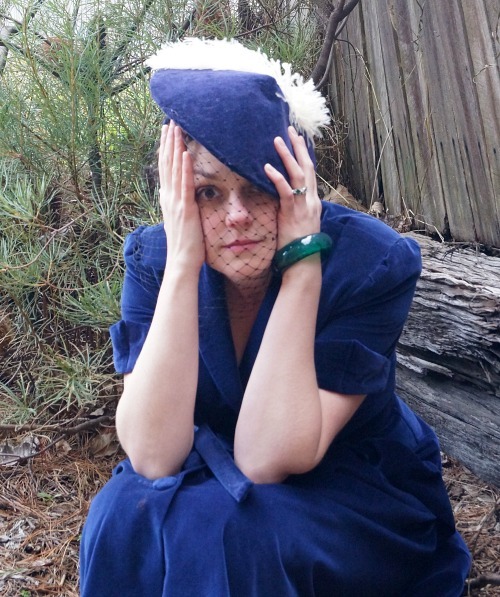 The velvet and buckram band was a comfortable and secure attachment, and I found the hat easy to wear. Keep in mind that if your hairstyle is very bulky you may need to make your band bigger. Mine was ok over my plaits, but it was more of a stretch than it had been when I tried it on with my hair down. If you can conveniently already own a matching velvet dress, you should do that. It worked well for me. 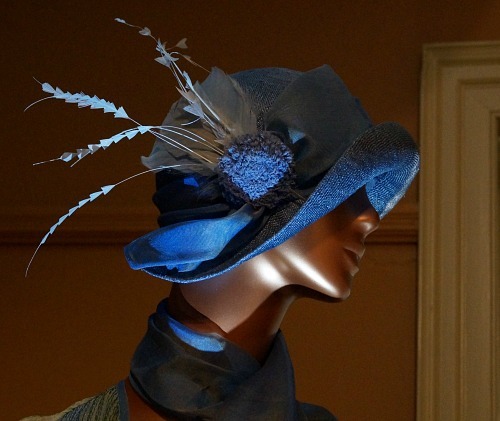 To my modern sensibilities, this is a fancy hat, suitable for evening wear or perhaps the races, and as such I can't see myself ever wearing it! On the other hand it is flattering, and it was quick and easy to make, with only hand sewing required. All in all, I rate this pattern pretty highly and would recommend it as a project for any one with confidence in their basic sewing skills. There is nothing advanced in it, but you do have to fill in the gaps in the instructions with your own experience and common sense. That's enough selfies for me! Too many, really. If anyone else makes this, I'd love to see the results and hear your experiences. If you've seen the 1939 movie "The Women", I'm sure you couldn't be anything but wowed by the fashions, and that definitely includes some stunning hats. When Jessica Cangiano and I were discussing our latest collaboration, we discovered that we were on the same page when it came to this movie. Love. Love. Love. 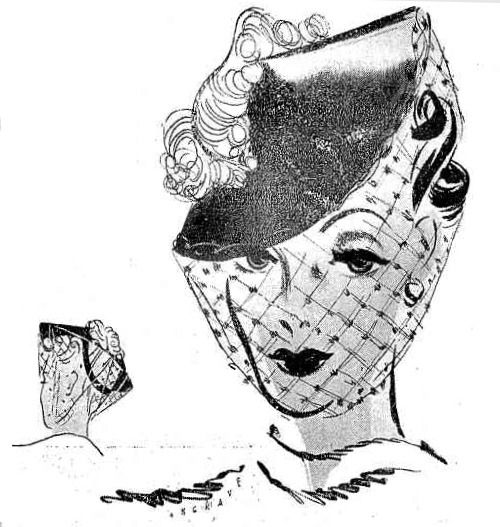 Jessica tentatively suggested attempting to create something like the lace draped hat with the big lace bow, worn by Rosalind Russell as Sylvia Fowler, in the scene where they stalk the perfume counter to lay eyes on Crystal Allen. I was one hundred percent on board! It is, however, a tricky one. It's beautiful. But it really isn't about the hat. 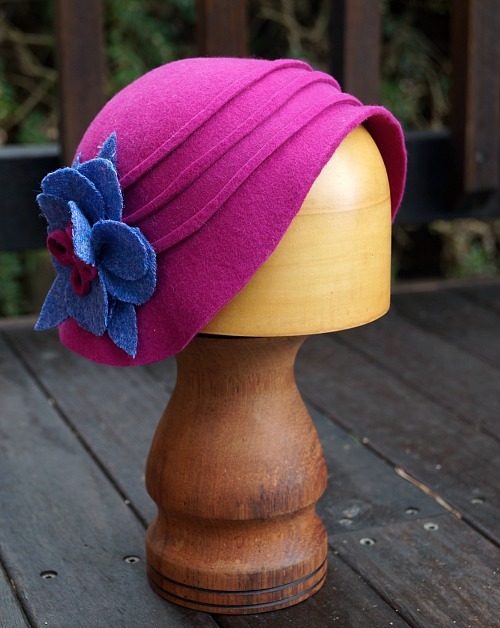 The hat is a base, a foundation, on which the lovely lace takes centre stage to make the big impression. I knew when I started the design, that getting the right lace was critical. And, to be honest, I wasn't impressed by anything I could find. Where nice vintage laces were available, they were usually not such a long length as this design called for, and they were very expensive for something I was just looking at through small images on a screen. 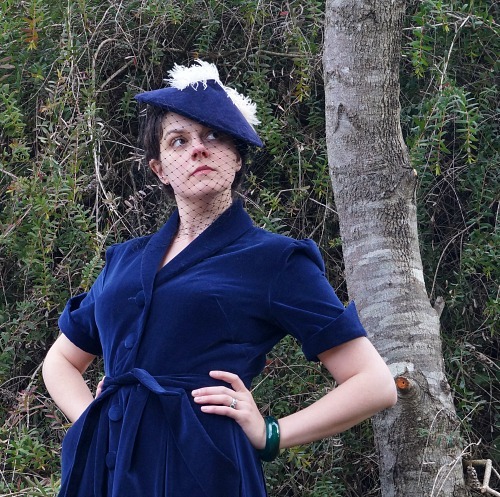 Perhaps in pre-child days I would have ventured out to the fabric shops in Marrickville or Cabramatta, but now I was really keen to find an online option. I looked for ages and wasn't making any headway. As it happens though, I had gone with my grandmother to a 'fibre muster' out in Bathurst and met and chatted to a woman named Sandy Fullerton. She and her husband Tom have this embroidery business. I bought a couple of embroidered patches and these cute greeting cards with embroidered motifs that the recipient can remove and sew on to something. We also chatted. Sandy was one of those people who was super enthusiastic about anyone creative and any creative venture. She was full of encouragement, advice and energy. She made a big impression on me. So here I was struggling with the lace. I hate making phone calls, but I called Sandy. 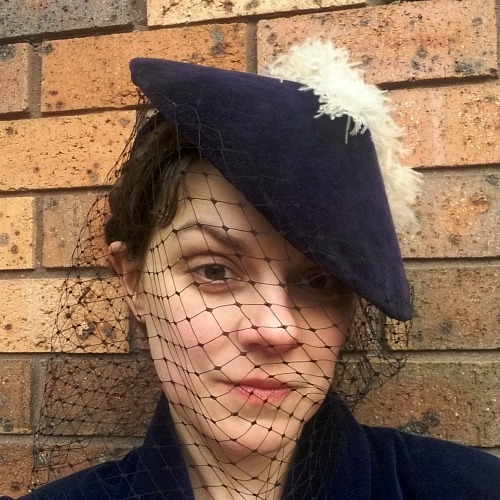 And the end result is this lace, and this hat. So it was worth it! 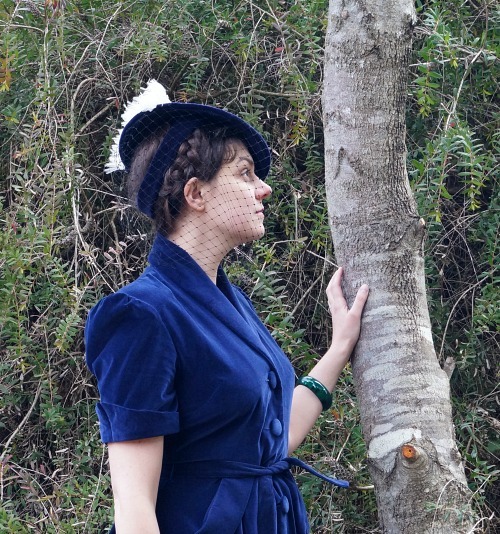 Since having a lace custom designed and made was a totally new experience for me, and is something that I imagine few people have done themselves, I wanted to share what it was like, and what I learned. Sandy and I discussed my needs, and I sent her an inspiration photo and my sketches. She told me a bit more about what was possible and suggested options. This went back and forth for a bit as I developed my ideas. I could have sketched a design idea myself for her to work from, but I was happy to let her handle the artistic side of things. So she sent me an initial sketch, which was simplified in a revised sketch, which became our final design. The design had to be digitised for the lace embroidering machine, and then she embroidered samples in different colours and sent images of those to me. Once I approved the design, I sent her the base fabric and chose the thread colour. Just within the bounds of the type of lace I wanted, there were many more options that could have been explored. Multiple thread colours, metallic thread, cut work, different widths, more elaborate designs, different lengths of pattern repeat. And that is just one type of lace. Being so lace-ignorant, I don't know much more, but I do know they have other types of machine that do mysterious other things. This design is, I'm informed, a one colour lace broderie with cutwork within, embroidered onto tulle. It took a long time to reach that level of decision. I came into the process with very little clear in my mind. After all, I called on a whim to see if this was possible, and ended up discussing types of lace and other things I didn't really understand. I just knew that the end result should look like! I knew the sort of width I wanted, and roughly the length needed. I would recommend having a better idea of what you need than I did. Sandy was excellent in guiding me to the right solution, but it would be much quicker and simpler if you knew the name of the lace type that you wanted, the basics of the design, and the colours, as well as the dimensions. Sandy waives the design fee for other local creatives, which was extremely nice, and evidence of her passion for a creative life. She did tell me that the fee would be in the vicinity of AU$300. But even without that, the lace was expensive. We are talking AU$150 plus GST for 2.88 metres, just for the embroidery. I had to buy the tulle for the base myself and send it to them, which was another adventure in itself. The initial more elaborate design would have been $300 for that length. I don't want to suggest that the expense wasn't worth it. It is 18cm wide lace, on the exact colour I wanted, colour matched thread, in a design that I dreamed up myself, that doesn't exist anywhere else in the world. It was never going to be cheap. 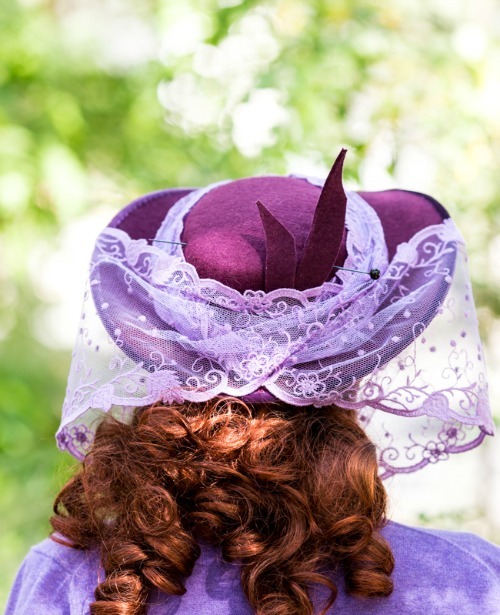 And how many hats use almost 3 metres of lace? Not many. 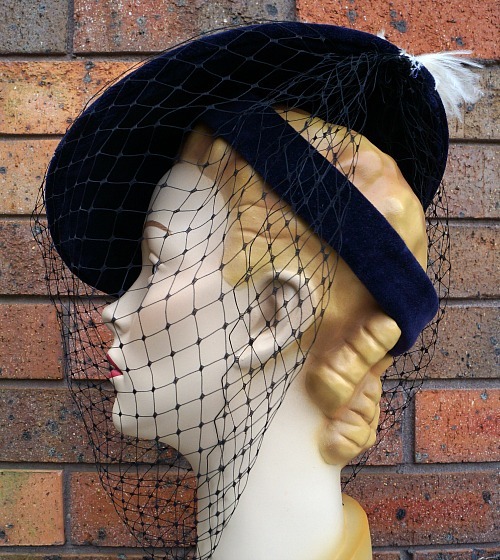 One metre would be a lot of lace for the average lace-draped hat. If I used this design for, say, a lace overlay on a fabric-covered hat, I might use only 20 or 30cms of it, or less. That comes out to a very reasonable price! 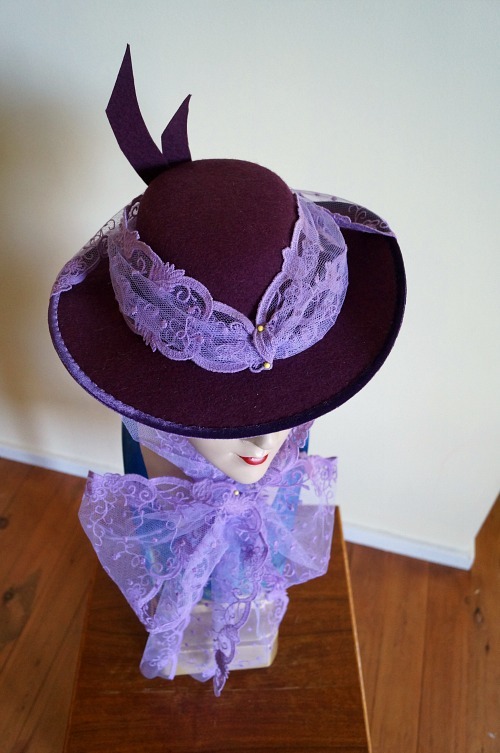 I think that if I were designing a collection and wanted to tie it together with lace on multiple hats, or I were trying to sell multiple of one design, that the expense would be very worth it. The value of having an exclusive material at your disposal would be hard to quantify. The decision process took about four months, which was largely on my side, as I had to make decisions about design and colour, buy and send fabric swatches and buy and send the tulle. From finalising the preparations to finished lace took about six weeks, but that was over Christmas. I would estimate that if you came in with a clear design and budget, and the knowledge to make further decisions quickly, the whole process might still take up to two months, depending on the current workload they had. The machines can only sew so quickly, and they had a queue of projects waiting on machine time. 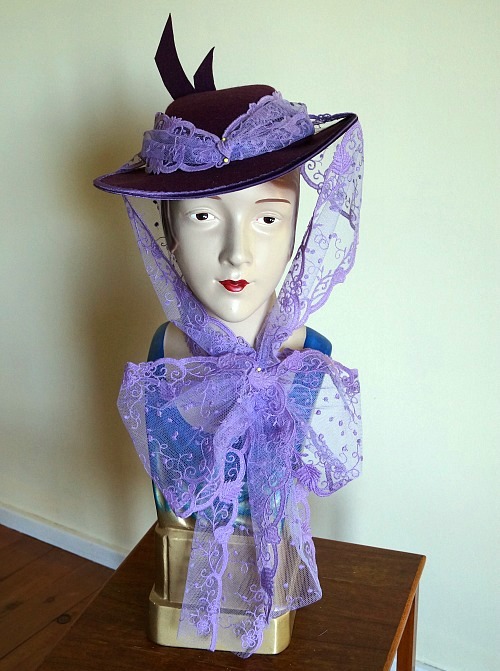 For the photos on my mannequin, you can see that they were taken when the lace was just pinned on so I could get feedback from Jessica, as I did at multiple stages of this project. You can see that the early sketches weren't how the final shape ended up either, but that we had the basic idea down pretty early. 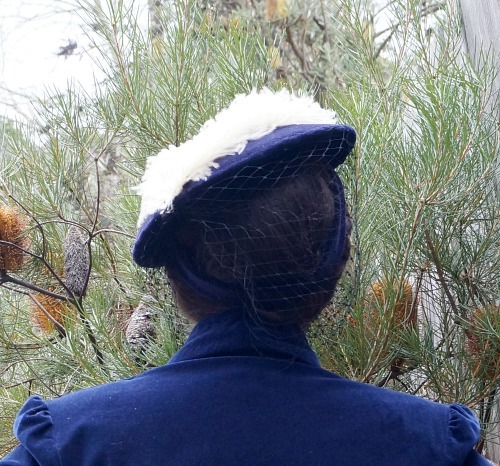 The rest of Jessica's outfit photos in this hat are here on her blog. Tom and Sandy don't have much of a web presence, but you can see some of their gift card designs on their website. I think having anything custom made by a specialist is an amazing experience but often one that you aren't sure how to navigate through, so I hope you found this an interesting peek into the process, even if it isn't something you are likely to do yourself! What I'd love to know is what you think of the strawberry design and what other colours and designs you think I should use it for? 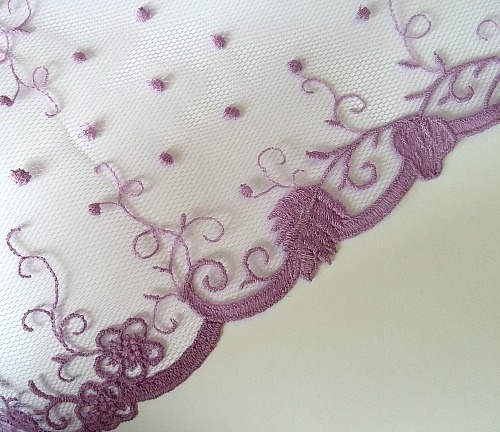 If you were going to have lace designed for you, what kind of pattern would you want? 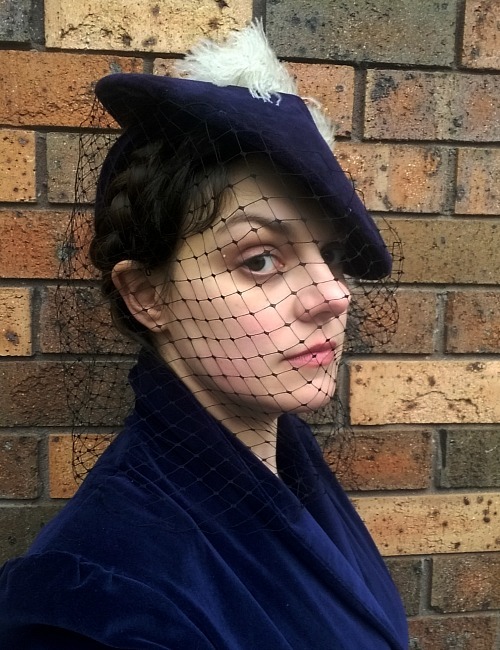 This year saw another round of the Miss Fisher Costume exhibition, and once more I attended and enjoyed the display very much. Since many exciting cultural events are in the centre of Sydney, which is quite a trek for me, I loved being able to just go as far as Parramatta for this one, and avoid the traffic and parking hassles that I have grown so used to not having in my life! I still haven't seen the show but I have now read the first few of the books. I'm sure I'll catch up one day. Old Government House is a great venue, conveniently located in a park so your toddler can run around afterwards and lie in the dirt and try to pat magpies. Like the last one, cameras were allowed, so I took what photos I could, while Teacup was happy in my friend's arms instead of mine. Actually, although I think the dramatic staging was even better than before, the lighting was not particularly conducive to getting good detail photographs. My friend was wearing a blouse that almost exactly matched this fabric! That's pretty special! There there were fewer hats this time around, and I really missed the whole room of hats from last time. 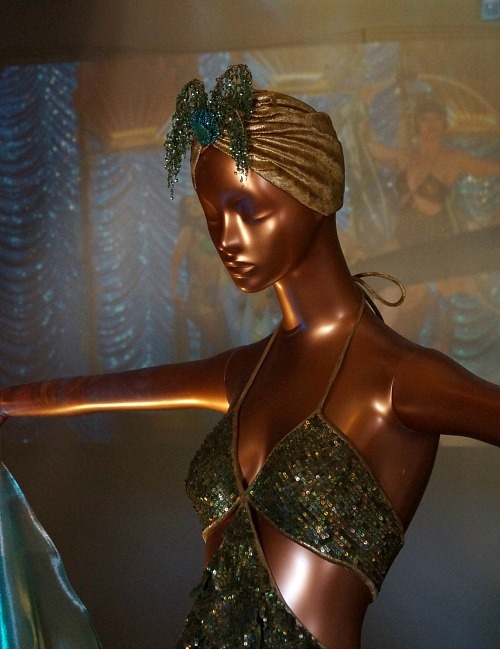 Some of the mannequins were rotating, which did allow a really fabulous 360 degree view of the outfits. 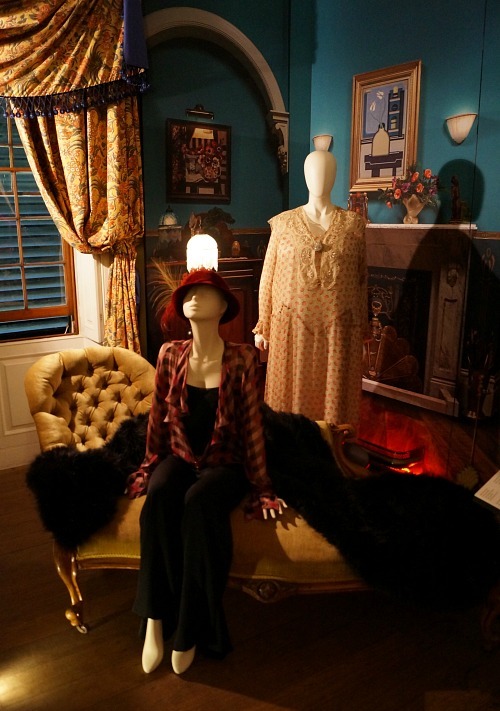 Another fun feature were two dress up rooms. 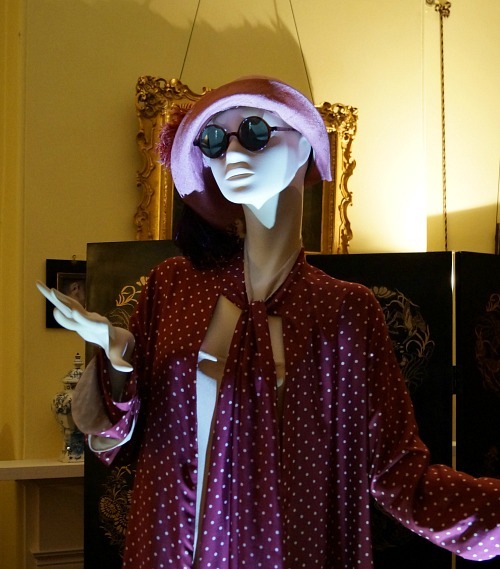 They had 20s-style dresses that were made so they could be thrown on over your clothes (with open fronts or sides), gigantic fluffy velvet coats, and aviator hats and goggles. 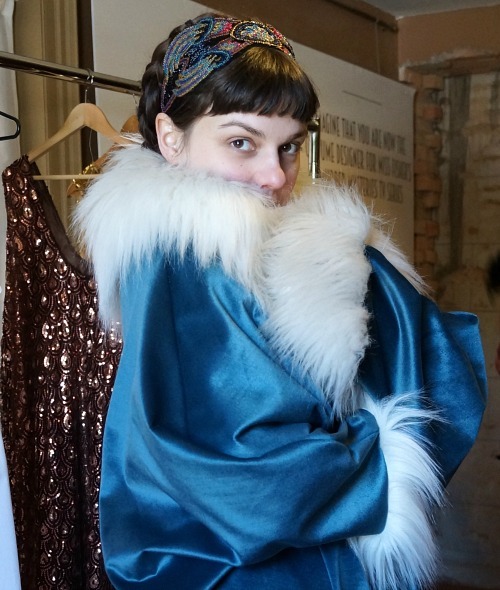 I love the look of the 20s coats, and they feel rather decadent and fun to play in, but they aren't something I can imagine myself wearing. The images I took last time are here if you want some more hat eye candy. 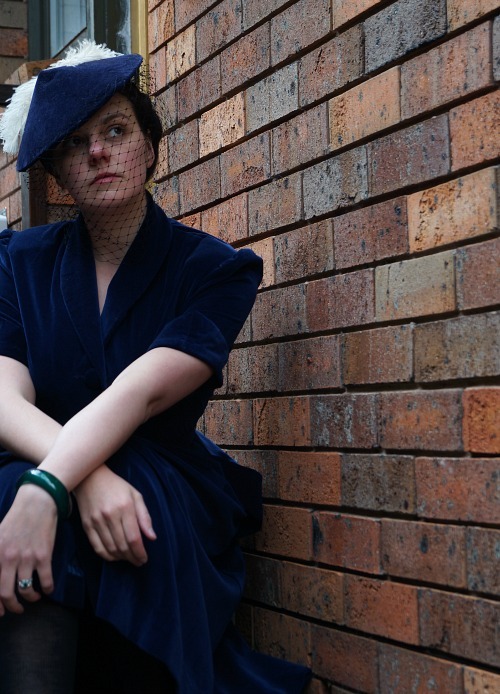 Are you a fan of Miss Fisher or 1920s style? 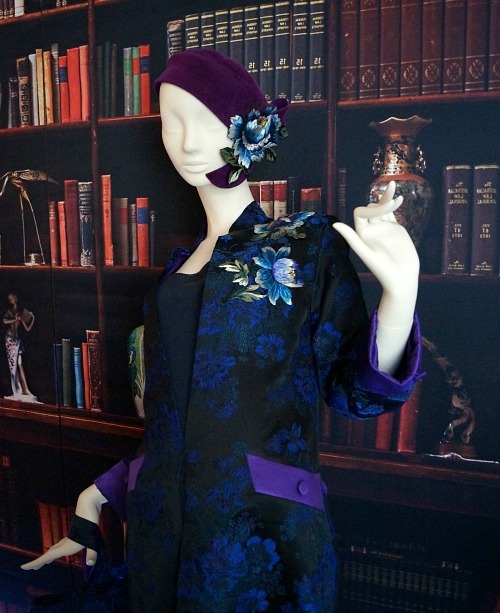 I think that first brocade coat with the purple hat is the outfit I'd choose from here, how about you?